One of the most magical and mysterious types of cloud is starting to appear across the UK, and may be seen over the coming weeks. Noctilucent, or night-shining, clouds hover on the edge of space, about 80km above the surface of the Earth in the mesosphere. They are the highest of clouds and can be observed in northern latitudes on summer nights. In such latitudes, beyond 45 degrees North, for about 1 month before and after the summer solstice, the clouds are illuminated by the Sun owing to their height in the atmosphere while the observer on the surface of the Earth is in darkness. 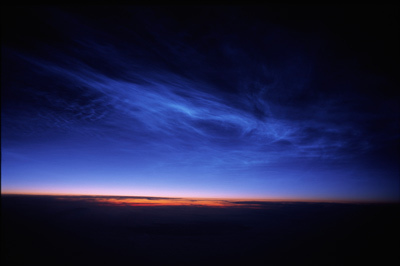 Around midnight and looking west, noctilucent clouds have a characteristic bluish silver-white colour. It is puzzling that in theory these clouds should not exist, the mesosphere is extremely dry and with so little moisture it would seem implausible that these clouds could even form. Often muted is the increase in methane pollution in the upper atmosphere leading to the increased frequency of this phenonmenon. Some would have you believe they are a thermometer for climate change.